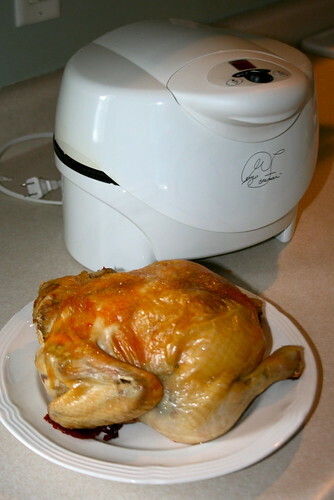 I wanted to share a picture of one of my favorite kitchen appliances. I don't use it that often but when I do I love it. It's the George Foreman Contact Roaster. (It looks like it's no longer available but there's something like it, if you're interested.) We got this several years ago with a Foreman Grill. Did not like the grill. We sold the grill and kept the roaster. The thing I love about it is not the so-so easy clean up but that I can put a chicken in it, set the timer for about 65 minutes, and walk away. When the timer beeps I know I have delicious falling off the bone chicken. Sometimes I fancy it up with seasonings or put fruit inside it. I'd love a good marinade if anyone has one without garlic. I have learned to put the chicken in breast down and it's even juicier. Kade came out and said "Yum, my favorite chicken." He likes the legs because he gets to play around with the bones. (I usually can't get the leg to come off with the meat intact and if I do the thigh comes along with it.) He checked out the chicken then said, "I don't see the head." I told him that the head gets cut off before it goes to the store. He replied, "Now that is gross." I had a good giggle. He's still willing to eat the chicken though. I cooked early today. I made corn bread muffins and sweet potato casserole to go with it. I'll cook some green beans to go with it. Can't wait for dinner time. Actually, it's me. Garlic just doesn't agree with me. Mickey's not a fan either. He now eats chocolate some times, especially when it's fudge striped cookies. Gross. Very good dinner, Sweetheart! Wish you all could have joined us, of course Kelly would have had to cook quite a bit more food, and then where would we have sat everyone? Oh well, it's the thought that counts, right? I think I might fly out for Kelly's chicken parmesean (and sugar cookies?!? ), even if I had to eat on the floor. Chicken parmesan, mmm...sounds good. I'll have to make that. Chicken cordon bleu also sounds good. Janel, I'll be making Valentine cookies soon. You should plan a visit then. I wouldn't make you eat on the floor. You can have my seat. I'll stand at the counter. this looks yum! I dont think I have any great marinades, but I do sometimes just use the rotisserie chicken spice and sprinkle it on. As soon as I saw your appliance, I wondered about the cleanup. I hate cleanup. This one sounds good though.